The Adjutant General’s Corps along with the Royal Electrical and Mechanical Engineers, the Royal Logistics Corps, Army Medical Services and the Intelligence Corps form the British Army’s combat service support forces. Royal Military Police (RMP): are the Army’s specialists in Investigations and Policing and are responsible for policing the military community. Military Provost Staff (MPS): are the Army’s specialists in Custody and Detention, providing advice inspection and surety. Military Provost Guard Service (MPGS): provides trained professional soldiers to meet Defence armed security requirements. Directorate of Educational Capability (D Ed Cap): provides learning and development opportunities for serving personnel. 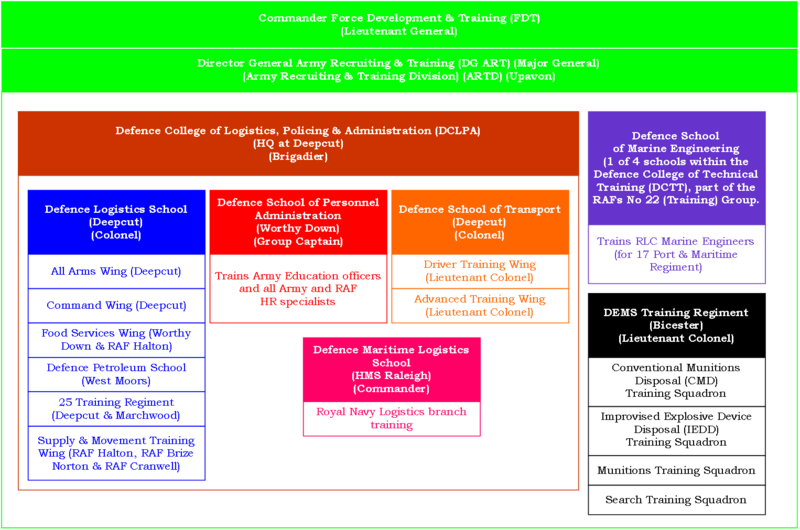 The Directorate of Educational & Training Services (Army) (DETS(A)) became D Ed Cap in 2013. Staff and Personnel Support (SPS): provides specialist HR, personnel and business administration, finance, accounting and ICT support to the Army. Army Legal Services (ALS): comprised of professionally qualified solicitors, barristers or Scottish advocates. AGC Phase 2 specialist training and Phase 3 career training is conducted at the Defence College of Logistics, policing and Administration forms part of the Army Recruiting and Training Division (ARTD), commanded by the Director General Army Recruiting and Training (DG ART), a Major General, who in turn reports to the Commander Force Development and Training, A Lieutenant General. The Royal Military Police (RMP) is part of the Adjutant General’s Corps, and is commanded by the Provost Marshal (Army), a Brigadier and Chief Officer of the RMP, based at Marlborough Lines in Andover. The RMP exists to provide the provost support that the British Army requires during peacetime and on operations overseas. Their primary role is to provide a policing and investigation service to the Army worldwide through the provision of a uniformed policing service and a plain clothed (Special Investigation Branch (SIB)) investigative force. HMS Dryad was the Royal Navy’s school of maritime warfare until its closure in 2004. The Defence College of Police and Personnel Administration opened in 2005 consisting of the three service Policing schools. The Regimental Headquarters of the RMP also moved to the site following withdrawal from Roussillon Barracks, Chichester. RAF Police training moved from RAF Halton in 2005. Royal Navy Police training moved from HMS Excellent. Police training for Royal Marines Police was formerly conducted at Rousillon Barracks and HMS Excellent, prior to their integration into the Royal Navy Police. During 2013 the Defence College of Police and Personnel Administration (DCPPA) merged with the Defence College of Logistics (DCL) and became the Defence College of Logistics, Policing and Administration (DCLPA), with Headquarters at Deepcut. Co-location allows the Services to exploit opportunities for common training in policing practice and the application of both civil and military law, with all three Service discipline systems being underpinned by the Armed Forces Act. Trainees are taught how to apply these principles within their jurisdiction in the UK and overseas in fixed military establishments and on operations. Common elements of military application are complemented by single service elements, allowing the individual to develop within their own Service. Examples of these include the use of personal weapons and military driving, handling of foreign nationals and Lines of Communication Policing, as well as the protection of logistic routes. Specialist training is then carried out at the DCLPA, Southwick Park, near Fareham in Hampshire. It is a 21-week course which will train soldiers to become a qualified RMP Junior Non-Commissioned Officers (JNCO), followed by 5-weeks of driver training. Training includes police duties and law including interviewing techniques and basic forensic awareness, unarmed defensive techniques and driver training. Some of the training will be police specific, this includes learning and studying the law and learning how to detect, investigate and report crime. Soldiers will also undergo operational specific training to prepare them for any conflict the British Army undertakes. Training also includes Personal Safety Training, where soldiers will learn how to utilise batons and handcuffs along with different techniques on a non-compliant subject. Soldiers are then placed in a mock police station and given police related scenarios to deal with. Upon successful completion of this course, soldiers will be promoted to the rank of Lance Corporal and posted to an operational unit as a probationer. Specialist training in areas such as close protection or special investigations will be undertaken in the first 4 years of a soldier’s career. Officers for the RMP undertake training on completion of the 44-week commissioning course at the Royal Military Academy Sandhurst (RMAS). Courses for officer candidates cover both policing and the management of policing within their service and joint environments. Service Policemen return to the DCLPA for promotion courses required by their respective Service and for specialisation training, allowing a focus on a particular aspect of investigation. The Special Investigation Branch (SIB): The SIB undertakes serious and protracted investigations and provides specialist support to investigations such as Scenes of Crime. They provide this service both in garrison and on operations. Close Protection (CP): the 8-week CP course trains operatives from within the RMP for the protection of senior military commanders and members of the Foreign and Commonwealth (FCO) officer. They also provide a number of on call trained operatives for the Foreign and commonwealth Office. The course provides the CP operative with enhanced weapon handling skills, advanced driving techniques, and personal protection and body-guarding tactics. 156 Provost Company provides police support to 16 Air Assault Brigade. RMP officers and soldiers who serve within 156 Provost Company have the opportunity to attempt P Company and earn their ‘wings’, and deploy in a PARA provost role. The Royal Marines Police Troop is made up of Royal Marine police NCOs; however, the troop is commanded by an RMP Captain. RMP officers and soldiers may also attempt the All Arms Commando Course (AACC) and attain the prestigious Green Beret and dagger badge. The DCLPA offers both initial trade training for members of the three service police branches and the Military Provost Guard Service. Promotion courses are delivered to allow individuals to qualify for progression to higher ranks and specialist courses afford individuals the skills necessary to focus on a particular area of policing. All RMP officers and soldiers have the opportunity to gain civilian qualifications as a result of their training in the RMP and all career courses are now vocationally/academically accredited. ‘The Advanced Apprenticeship in Policing’, in conjunction with Babcock International (2014a; 2014b), is now completed at Phase 2 training and during a soldier’s first assignment. It is the equivalent of 4 A Levels. During the first assignment soldiers will qualify for a City and Guilds Level 3 Diploma in Knowledge of Defence Policing (Academic Certificate 40 credits) and a City and Guilds Level 3 Diploma in Policing (Vocational Diploma 38 credits). This includes ‘Work book learning’ through Babcock. Functional skills in numeracy and literacy are also tested to Level 2. Subsequent specialist training will include undertaking the Volume Crime Investigation Course as a Corporal (Certificate in Professional Investigation from Teeside University, 30 credits) which is a Level 4 intermediate qualification. Soldiers may then have the opportunity to undertake the Serious Crime Investigation Course as part of the Special Investigation Branch entry criteria (Certificate in Professional Investigation, 60 + 30 credits) which is a Level 4 Advanced Qualification. Finally the Crime Scene Investigation Course (Certificate in Professional Crime Scene Investigations, 40 credits) may be undertaken and on completion of a 2,000 word essay, this Level 5 qualification may be awarded. Teeside University can then offer the following modules to top up to a Foundation of Full Degree: Intelligence-led policing, concepts of terrorism, counter terrorism. It is only these top up modules that would be required to be paid for by the individual. Training is accredited by the University of Teesside and is validated by the College of Policing who assure standards on behalf of the Home Office. Training was formerly validated by the National Policing Improvement Agency (NPIA) but this agency closed on 07 October 2013. The RMP are subject to external inspection by Governmental Inspectorates such as Her Majesty’s Inspectorate of Constabulary (HMIC). Reports can be found on their website. The Military Provost Staff (MPS) are the British Army’s specialists in Custody and Detention, providing advice inspection and surety within custodial establishments. They are under direct command of Provost Marshal (Army) and are based primarily at the Military Corrective Training Centre (MCTC) at Colchester from where they deploy regularly in support of operations. The MPS, like the RMP, are distinct from their civilian counterparts in HM Prison Service. Manned wholly by volunteer transfers from the Services, their main task is to provide rehabilitation training within a secure environment for Service personnel who are either to be retained in the Service or be dismissed. The manning of the detention companies within the MCTC and the provision of military instruction to service personnel under sentence is their main role at home. Outside MCTC the MPS provide a custodial service to the Services conducting mandatory inspections of Unit custody facilities, and investigate incidents in unit guardrooms, which relate to custody. The MPS also provide the Unit Custody Staff Course (UCSC), which trains unit regimental police personnel in the operation of unit custody facilities. The MPS also provide operational support through the provision of advice on Prisoner of War handling through the Provost staffs and provide the technical advice required to the PW Guard Force and monitor the PWs in custody. Like the RMP, the MPS operational role in Peace Support Operations (PSO) has historically sent them to deal with the myriad of custodial issues that affect host nations in the event of the collapse of Law and Order. Presentations to assess instructional ability. Suitable applicants will move to stage 2, although those found not suitable will be returned to unit. The Role of the MPS in Peacetime and on Operations (including PW Handling). On completion of the Probationers course successful candidates will be transferred to AGC (MPS) in the substantive rank of Sergeant, on completion of the SNCO CLM course. Those who hold a higher rank must be prepared to revert to Sergeant. Promotion prospects within the AGC (MPS) are rated as excellent and the potential of reaching Warrant Officer are good; however, MPS are paid on the lower spine. Opportunities for Late Entry (LE) commission within the MPS are available at the later stages of a Custodial Specialist’s career as MPS officers are sought solely from the ranks of the AGC (MPS). At present the Corps has six LE officer posts, five within MCTC and one E1 posting. Custodial Advisors: responsibilities are to advise outside agencies and units on custodial matters and PW handling with posts in Germany, Aldergrove, Falkland Islands, Catterick and Worthy Down. MPGS Training Team: training members of the MPGS in all aspects of security and base protection with posts in Worthy Down. Provost Posts: subject matter experts whose responsibilities are to advise unit custodians on all custody matters with posts in Southwick Park & Worthy Down. CQMS: current posts in ATR Winchester & Worthy Down. The Military Provost Guard Service (MPGS) provides professional soldiers to meet armed security requirements at Royal Navy, Army, RAF and other MOD bases in Great Britain. Stationed at over 100 units, the MPGS have their own Military Local Service Contract which allows soldiers to choose where they wish to serve, providing there is a vacancy. Controlling entry and exit to a site. Managing control room operations & ensuring all visitors are dealt with efficiently. Patrolling site perimeters & taking necessary action to preserve perimeter security. Security incident management, e.g. suspicious packages, bomb threats & protests. Military Working Dog services at some sites. The MPGS is part of the Provost Branch of the Adjutant General’s Corps and is under the direction of Provost Marshal (Army), who is the Director and Head of Service. MPGS units are formed under the command of their respective Head of Establishment, with Provost Marshal (Army) maintaining technical standards through annual inspections. Each MPGS unit has a structured rank system that provides opportunity for promotion to Senior Non-Commissioned Officer (SNCO), and Warrant Officer Level 2 (WO2) rank at some sites. Given the size of the MPGS, a number of Warrant Officer Level 1 (WO1) opportunities exist across the country. Promotion is based on merit and uses the same system of annual performance appraisal as the Regular Army. All MPGS Soldiers are trained at the DCLPA, Southwick Park, Fareham. The Defence Guarding Specialist Course lasts five days, and is designed to provide soldiers with the knowledge and understanding required of a professional armed security guard. The course takes account of previous service history and, therefore, does not replicate many of the areas of Phase 1 initial training, such as foot drill, room inspections and parades. The Directorate of Educational Capability (D Ed Cap), formerly the Educational and Training Services (Army) (ETS(A)), provides learning and development opportunities for serving personnel wherever they are around the world. The ETS(A) became D Ed Cap in 2013. D Ed Cap, commanded by a Brigadier, is a specialist all officer branch. Learning Development Officers (LDOs) work wherever the British Army is based and provide officers and soldiers with the military knowledge and functional skills required to be effective in their job and to progress in their careers. LDOs deliver Command, Leadership and Management (CLM) courses to officers and soldiers and deliver and assure Army Instructor Development. Army Reserve LDOs, for whom professional development options are being developed, are required to be qualified teachers on entry. Regular Army LDOs follow a professional development path from the Post Graduate Certificate of Education (PGCE) to a Masters Level degree, with academic and personal development expected, encouraged and supported throughout an officer’s career. Following completion of their PGCE, which is begun upon commissioning from the RMAS, regular officers go on to complete a Masters Degree and train as Training Development Advisors (TDAs); Reserve officers, who hold a Masters degree, may also undertake this role. TDAs work in training schools, headquarters and policy directorates at single-Service and Defence level. The Staff and Personnel Support (SPS) branch, commanded by a Brigadier, is the largest branch of the AGC and provides specialist HR, Personnel and Business Administration, Finance, Accounting and ICT support to the British Army, during peacetime and on operations. Its personnel serve alongside and administer every unit in the British Army. Information Technology Qualification (ITQ): 2 weeks are dedicated to the Apprenticeship for IT Users. During this period soldiers are given initial assessments on their literacy, numeracy and IT skills. Each soldier receives an Individual Learning Plan specific to them to aid them through the apprenticeship. They then receive IT, numeracy and literacy training, work through practical exercises and produce a portfolio of ITQ and Key Skills evidence through work-related scenarios. Several one-day ITQ workshops throughout the remainder of the SIPAC allow the soldiers to consolidate their learning and draw further ITQ evidence from their work. Adventurous Training (AT): all soldiers are given the opportunity to complete a weekend of low level AT during the course. This form of military training involves several outdoor activities e.g. mountain biking, orienteering and hill walking. It provides a challenge and helps develop teamwork, moral and physical courage among other personal attributes and skills vital to underpinning the Army’s values and standards. This also aids soldiers by giving them an insight into possible activities which they may be required to organise later in their military careers. Physical Training (PT): the level of physical training intensifies progressively. All soldiers are tested formally on their fitness standards throughout the course during the Personal Fitness Assessments (PFA), maximum press-ups and sit-ups in 2 minutes followed by a best effort mile and a half run, and towards the end of the course during the Advanced Fitness Test (AFT), 8 mile endurance march carrying 15kg within a time limit. There are 4 formal PT lessons a week, including loaded marches, circuit training, assault course sessions and cardio training. Soldiers are exposed to combat conditioning throughout a variety of PT lessons in order to enhance their ability to withstand the rigours of deploying on an operational tour. The culmination of the PT lessons is the endurance race involving a stretcher race, log race and the assault course when the soldiers are regularly presented with the opportunity to challenge the officers within the SPS. Basic Close Combat Skills (BCCS) exercise: this 3 day deployment into the field environment reflects the deployment on operations. Soldiers deploy with weapons and bergens into mock Forward Operating Bases (FOBs) and Patrol Bases (PBs) to conduct realistic patrolling scenarios whilst also carrying out the daily administrative tasks which are to be expected as a Combat HR Specialist. After completion of the 44-week commissioning course at the RMAS, SPS officers will attend an 11-week course specialising in administration, finance and IT training. Training will continue during an officer’s first assignment as a Detachment Commander where they will be expected to complete a number of training objectives as part of a Work Training Booklet. Personal legal advice service for soldiers and their families when deployed overseas. Director Legal Advisory: Army lawyers working within an advisory Branch advise the chain of command on a range of issues such as Army policy, operational and criminal law. Duties range from providing guidance, to training commanders and soldiers in all aspects of Service discipline. Brigadier Operational Law: with the Army’s operational commitments showing no sign of decreasing, the skills and knowledge of legal Officers are increasingly in demand. They can be called upon to advise commanders and other military personnel on all aspects of Service and international law. Deputy Director Service Prosecutions: the Service Prosecuting Authority (SPA) is a Tri-Service organisation similar in function to the Crown Prosecution Service (CPS), deciding which cases go to trial at the court martial. Army lawyers prosecute in court, regardless of whether they are solicitors or barristers. After completing the Professionally Qualified Officers course at RMAS, legal Officers spend time at Andover learning about Service law at the ALS HQ (British Army, 2011). The intensive course covers international and operational law and policy, which includes the Geneva Conventions, Law of Armed Conflict and Rules of Engagement. Officers also study service and criminal law and procedure, such as drafting charges and preparing cases for trial by the Court Martial. The aim of this course is for Officers to gain a solid understanding of what is expected of a legal Officer in the modern British Army. In 2012, it was estimated that the cost per soldier recruit for Phase 2 training for the Adjutant General’s Corps was £13,500 to £52,720 (HC, 2012). Babcock International (2014a) Military Training. Available from World Wide Web: http://www.babcockinternational.com/capabilities/training-education/training/military-training/. [Accessed: 20 March, 2014]. Babcock International (2014b) Police Service Training. Available from World Wide Web: http://www.babcockinternational.com/markets/training/emergency-services-training/police-service-training/. [Accessed: 20 March, 2014]. British Army (2011) ALS: Army Legal Services. Available from World Wide Web: http://www.army.mod.uk/documents/general/ALS_career_guide.pdf. [Accessed: 20 March, 2014].